Do You Know that you can search just the Marriage Records and Marriage Clippings on the site by using the Marriage button in the Partitioned search engine at the bottom of the Current What's New Page? Be aware that you will also find some marriage notices in the Clippings partition and on the Bibles pages. 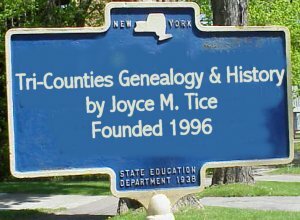 Marriage records: copy of the original records of marriage by Rev. 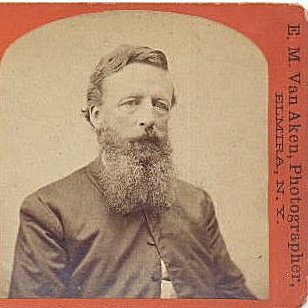 Thomas K. Beecher of Park Church, Elmira, New York from 1854 to 1900. Copied for the Chemung Chapter D.A.R. by Addie JOHNSTONE "Staver" in 1938. Retyped for Tri-Counties by Darla Hogaboom. Nov. 16 State Line South Creek, PA. Herman M. Comstock and Mary Fassett. Witness: N. P. Fassett lawyer, Parents and all witnesses. Dec. 25 At house of bride’s stepfather. J. Howard Titsworth and Eunice H. Lewis. Witness: Mother, brother, etc. May 21 John T. Bravvo and Elizabeth Seely. Witness: Brides sister and two cousins. July 3 Wm. C. Tompkins and Henrietta Davis. Corner Orchard and Church Streets. Oct. 4 At church. Thomas Jefferson Tuttle and Charlotte D. Steele. Witness: Friends of Deacon Cleves. Oct. 23 At Fairman's House (C. G.). E. G. Baldwin and Elizabeth Curtis. June 4 At bride’s fathers. George B. Clark and Harriet A. (Sly) Maxwell, Father was Thomas Maxwell. Jan. 12 At S. Bolles corner 6th and Main. James L. Miller and Cordelia S. Baker. Mar. 30 Owego, NY. At house of Mr. and Mrs. Stevens. Elijah Johnson (Dentist) and Rose Ely. She was the sister of Mrs. Stevens. Oct. 19 At Watkins, NY. At brides fathers between 5 and 6 A.M.
Feb. 9 At bride’s mothers. Many witnesses. John B. Rockwell and Mary A. Orwan. Feb. 23 William S. Martin and Abigail S. Davis. At her fathers D. Davis down river four miles. April 12 At Mt. Vernon, Ohio. A. T. Welch and Eunice Buckingham. Sept. 5 Williamsport, PA. At the house of Waldo Willard. Jacob D. Mitchell and Josephine L. Willard. Sept. 6 James McQuire of Rochester, NY and Mary Ellen Flood. Witness: At. Dr. Floods, Parents of both parties were present also Mrs. Beecher. Sept. 13 S. G. Comstock and Lizzie Anderson. At home of bride’s father. Mrs. Beecher, parents and others. Nov. 9 John Milton Roe and Laura S. Temple. At brides mothers Gray Street. Feb. 9 Ethan W. Howes and Francis A. Pierce. Daughter of Peter Pierce. May 30 Oscar W. Bundy and Mary Weed daughter of William B. Weed. Nov. 3 Joseph Thomas and Marie Robertson. Both from Pennsylvania. Nov. 24 (see March 30, 1858). At house of Mr. and Mrs. Seely. Witness: Mrs. Beecher, Elijah Johnson and Mrs. Stevens. Dec. 24 At Mrs. Cleeves'. Joseph S. Norton and Mary W. Cleeves. Jul. 20 At 139 Water Street upstairs. Joseph E. Dunham and Sophia M. Weir (He is a soldier ordered on duty tonight). Nov. 9 At Rooms. Benj. W. Smith and Adeline Strader. Both from Big Flats at 11 A.M.
Oct. 25 At John Lowman’s in Chemung. Samuel W. Tubbs of Elmira and L. Rose Brooks of Chemung. Witness: Mrs. Brooks, Mrs. Beecher, Lieut. Tubbs, many others. Jan. 3 John A. Comstock and Mary Francis Anderson. Married by J. C. Beecher. Families present. May 31 Priney S. Tanner and Sarah Jane Greeno. He of Millport and she of Elmira. July 2 Thomas R. Rutherford of Washington, D.C. and Mary Ann Smith of Elmira. ---------- Israel O. Scudder and Julia Farrand. At church. Oct. 6 At house of Moore, Pigeon Point. Edwin L. Bowers and Jane Moore. Dec. 1 At Hudson St., 5th Ward, Elmira. William Matthews and Elsie E. Bailey daughter of Isaac H. Bailey. Witness: Parents, brothers and sisters and many more. Afterward attended Dr. UpDeGraffs TIN WEDDING. Feb. 2 At Langdon’s. Samuel L. Clemens and Liva Langdon. This is MARK TWAIN. Mar. 16 Frank C. Richmond and Helen L. Gallagher. Aug. 3 At Waverly at F. H. Baldwin’s. Otis B. Skinner of Garnett, Kansas and Connie L. Baldwin of Waverly. Witness: John B. Jr. and wife and Charlie. Sept. 18 Mrs. Sarah C. Scudder of Ashland and Mr. Walter Scudder of L. I.
Feb. 2 At 28 Fourth St. corner Main. Albert H. Marion and Jennie M. VanAmburgh. Sunday 6:15 P.M.
Apr. 16 Wednesday at Watkins. John A. Hobbie (Nat. 1848 at Irondequoit, NY) and Susan H. Hayes (Nat. 1850 Cuba, NY). Witness: Troops of Hall cousins and George and Alice Hobbie. June 17 At Rooms, Baldwin St. 2:15 P.M. George Hall aged 30 Fitchburg, Mass. and Susan Titus Williams aged 21 Elmira, NY. Hall is single express messenger. Native born, his run is from Fitchburg to Providence, R. I. Susan is daughter of Mr. and Mrs. J. W. Williams corner Water and Hoffman Streets. Dec. 17 At Mrs. Flett’s. William Edward Dearth and Elizabeth H. Flett. Witness: J. J. B., Clara, Julie and Sackett, Jr.
Apr. 16 At rooms, Baldwin St. Charles Dalrymple, son of Daniel D. Dalrymple of Southport and Emma Metzger, daughter of Seth H. Metzger. He aged 20, she is 17. They are to live at home of D. D. Dalrymple. Dec. 29 At home of W. S. Carpenter of Big Flats. Lewis Fitch and Caroline Beckwith, at 2:00 P.M.
Sept. 12 Charles E. Stagg and Ella C. VanAllen. Many witnesses. Oct. 10 At William Ogden’s house. Nellie B. Ogden and Benjamin Andrews (saw manufacturer). Many witnesses. Oct. 17 At parlors of Park Church. 7:30 P.M. John B. See and Jane Pengelly. Witness: Wm E. Dearth, E. H. Dearth, and others. Nov. 22 In library Park Church. 5:45 P.M. Herbert A. Doxey and Gertrude LeFevre. Witness: E. P. Bement and wife, Charlie Gridley and others. Apr. 10 Arcalous Wykoff and Carrie C. Hull. Witness: Mr. and Mrs. Smith, Georgie Hull and others. May 28 James F. Baker and Hattie L. Barber, Orchard St.
May 20 At I. S. Copeland’s 107 East Hudson Street. Frederick Charles Rolls and Harriet Agnes Copeland. Witness: Henry Rolls, others. Both were from St. Catherine, ONT. Feb. 2 Partridge Street. Joseph W. Price and Mary Ann Craze. Aug. 21 J. Phillip Arnholt and Alice L. Cooke daughter of F. J. C.
Dec. 16 Charles Haupt and Minnie Stoll at 556 John Street. Jan. 19 At house of Jonas King on Gray St. at 8:00 P.M. Monroe Murphy of Sioux City, Iowa and Anna A. King of Elmira. Witness: Mr. and Mrs. Oliver A. Badger, Mr. and Mrs. A. S. Carter, Jr.
Feb. 20 Sunday evening 8:30 at 143 West Water St. George F. Mapes of Yates Co. NY and Ella J. Cortright of Auburn, NY. Jan. 28 Charles L. Bristol of Vermillion, South Dakota and Ellen Gallup of Ledyard, Conn.
June 4 Wednesday 8:00 P.M. at F. Sheeley’s Home Bulkhead Road. Ephraim Dalrymple and Mary E. Sheeley. Witness: Edward V. Sheeley, George K. Sheeley, John C. Sheeley, Fred Sheeley, Jr., Charles Sheeley, Henry B. Sheeley, (brother) William Sheeley VII (the 7th) not present. June 26 At 104 Brand St. Wednesday 8:00 P.M. Merrick J. Roper and Phoebe A. Strong. Witness: Pamela Strong, S. W. Foreman, Esq., Mary P. Foreman, Ella Wisner, Warren Miller and others. Dec. 16 Hartford, Conn. At 239 Market St. 4:00 P.M. William Augustus Ayers and Elizabeth Lee Sluyter. Witness: Elizabeth Goodrich, Mary Bell, C. H. Bell, Alice Ayers, Laura Helen Sluyter, J. P Hayes, Elizabeth Sluyter, Myra Spofford Lee, Very Rev. James Theges V.G. Feb. 11 Wednesday evening 629 W. Church St. Darwin W. Mead of Harrisburg and May E. Robbins of Watkins. June 12 William L. Ratcliff of Lynn, Mass. and Helen S. Larkin of William St. Elmira. Witness: Mrs. M. Olmstead, Alice Larkin, J. F. Radcliff, Jr.
Dec. 5 12 noon at church parlor. William S. Toby of Caton, NY and Martha W. Stone.